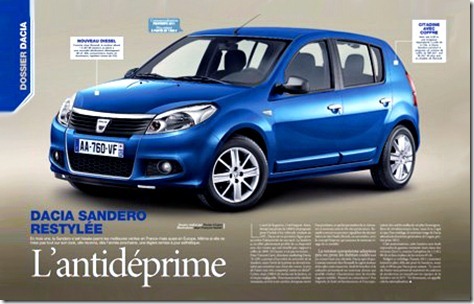 The French from Auto-Journal presented a digital picture of the Dacia Sandero facelift. While the model has not been officially announced by the Romanian car manufacturer, an aesthetic change is probable in the near future along with the debut of the new Euro 5 engines. The designer who made this digital processing has succeeded in creating a credible-looking model, changing only minor items that succeed to refresh the look of Dacia Sandero. 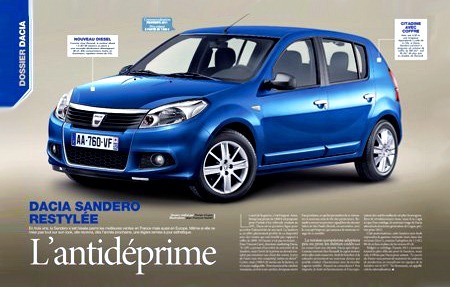 In this case, the Sandero received a new bumper, a new set of projects, a set of alloy wheels and a set of new stops. The hood seems to be modified and the lights keep their shape by change their content. The front grille and the front side seem to have been inspired by the Laguna facelift. The projectors are now framed by stronger design elements created to provide more character to Sandero. Im using dacia sandero. This car is very powerful. Im happy for driving it on traffic. thats comfortable.